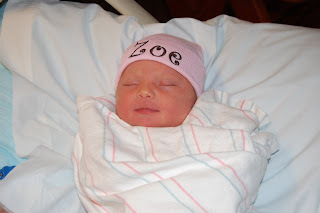 December 12, 2008, 8 LBS 7.3 OZ our Zoe Madelyn was welcomed into the world! Building sand castles with daddy! 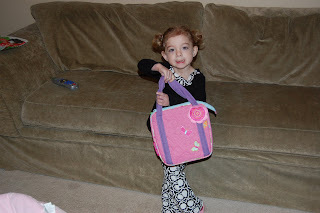 Showing off her lunch box for her first day of school! Hello Everyone! 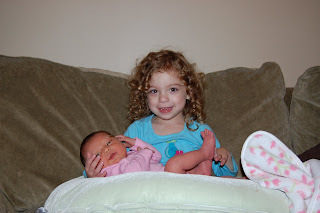 We have decided since everyone else had a blog that it was time we added one too for our little girls. We hope you enjoy watching our girls grow and explore new things. 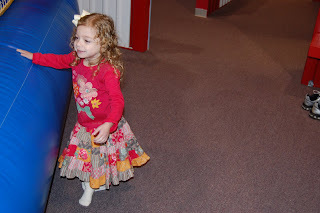 Ava just turned 3 and had a great birthday at the Jumping Jelly Bean! 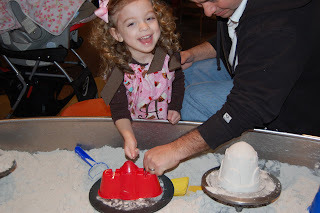 She also spent her birthday with mommy, daddy, and Zoe at the Children's Museum in Atlanta where she played in the sand, painted, grocery shopped, and got to dress up! The very next day Ava started preschool. She loved playing with her friends, doing art, and swinging really high on the swings! She had such a big week, she even went for her second cleaning at the dentist. Although that didn't go very well, she was scared of the dentist and mommy had to hold her, she got good prizes at the end which made her feel better. Yesterday she went for her 3 year check up at the doctor and luckily didn't have to get any shots. Our little Zoe is getting so big too. She was 7 weeks old last Friday! She has started smiling a lot more and is realizing she has a voice. She is gooing and gaaing all the time. 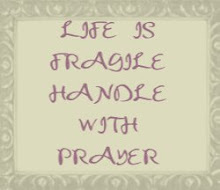 She is so funny when she gazes at her hands wondering what they are. She loves to smile at her big sister and watches her all the time! Sweet baby girls! Ava's hair is so cute up in her pig tails! 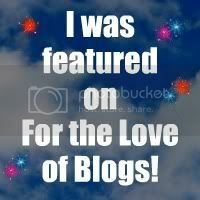 I'm glad you started this blog, so I have a chance to keep up.